Marion Body Works, a leading manufacturer of Fire & Emergency Apparatus, Commercial Truck Bodies, Aluminum Custom Cabs, Custom Engineered Vehicles, and Defense Products, is proud to announce the hiring of Scott Benjamin as the company’s Business Development Manager for Defense and Cabs. Scott will be responsible for identifying growth opportunities with Defense Prime Contractors and other customers in the Tactical Wheeled Vehicle markets, as well as defining new Cab and Enclosure markets outside the fire apparatus segment. 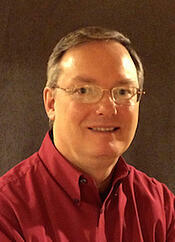 He brings 30 years of truck industry sales and marketing experience to the team. Curt Ignacio, President of Marion Body Works, says Scott’s experience in the Defense industry enables him to strategically leverage Marion’s manufacturing capabilities and Defense-related credentials, which include ISO 9001 certification, International Traffic In Arms Regulations (ITAR) compliance, lean classification for Defense projects, small business classification, and American Welding Society (AWS) welding inspection certification. “Given Scott’s previous sales experience in both the Commercial and Defense industries, we’re confident in his ability to capitalize on new sales opportunities, and improve our current sales process with these customers. We’re very excited to have him on board, and we can’t wait for all the new opportunities he’ll bring us,” he said. Prior to joining Marion, Scott spent 30 years at Navistar in various sales and marketing roles. His last three years were with the company’s Defense Group and the first 27 with the Commercial Truck Group. Marion Body Works manufactures Fire & Emergency Apparatus, Commercial Truck Bodies, Aluminum Custom Cabs, Custom Engineered Vehicles, and Defense Products for customers across the country. Marion has been privately owned, family operated, and continuously operated in Marion since they were founded in 1905. Marion specializes in all aluminum products, with more experience in this area than any other U.S. manufacturer. The company’s capabilities include aluminum and steel fabrication, welding, plumbing, foam insulation, hydraulics, electrical and electronic controls and painting. This press release was originally published on PRWeb. Marion Body Works manufactures Fire & Emergency Apparatus, Commercial Truck Bodies, Aluminum Custom Cabs, Custom Engineered Vehicles, and Defense Products for customers across the country. Marion has been privately owned, family operated, and continuously operated in Marion since they were founded in 1905. Marion specializes in all aluminum products, with more experience in this area than any other U.S. manufacturer. The company’s capabilities include aluminum and steel fabrication, welding, plumbing, foam insulation, hydraulics, electrical and electronic controls, and painting.